Greetings. 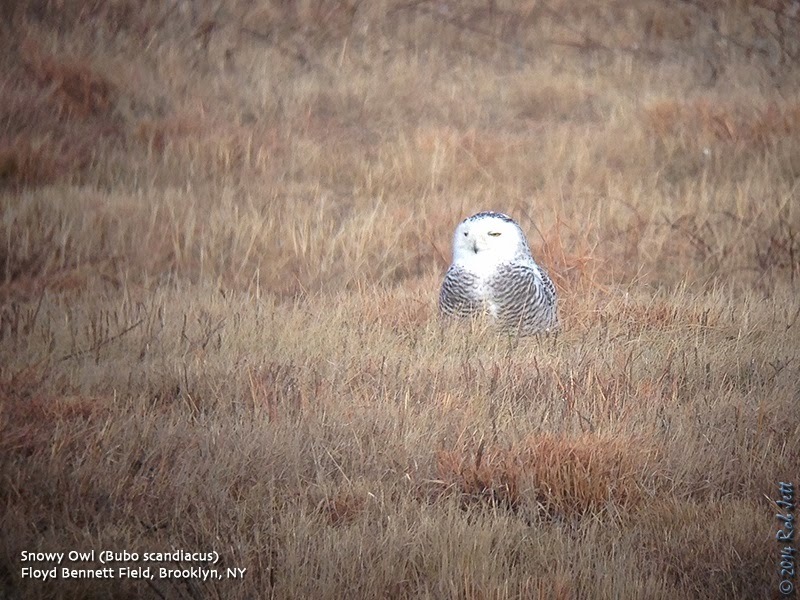 This is the New York Rare Bird Alert for Friday, January 31, 2014, at 5:00 pm. The highlights of today's tape are MEW GULL, PINK-FOOTED, BARNACLE and GREATER WHITE-FRONTED GEESE, BLACK-HEADED and GLAUCOUS GULLS, KING EIDER, HARLEQUIN DUCKS, NORTHERN SHRIKE and much more. 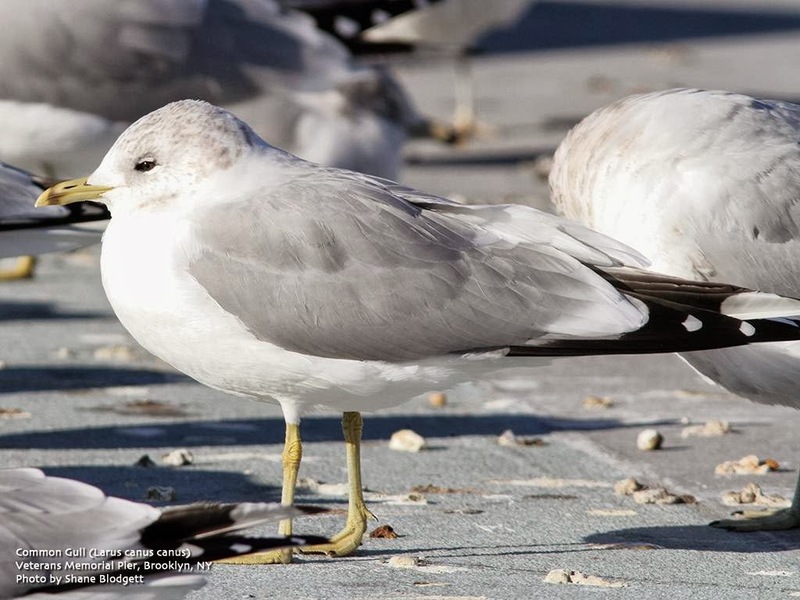 The Brooklyn MEW GULL, judged to be the Eurasian subspecies referred to as COMMON GULL, that was found last Friday the 24th on Veterans Memorial Pier was seen at that location both Saturday and Sunday briefly in mid-afternoon but has not been reported since. Besides the pier, places to look would include around the waste water treatment plant across from Owls Head Park or at the various Gull roosting spots along the Belt Parkway on the south side of the Verrazano Bridge down towards Coney Island Creek. Also noted around the pier this week have been a drake EURASIAN WIGEON and an immature ICELAND GULL, with two LESSER BLACK-BACKED GULLS at Coney Island Creek on Saturday. Out on Eastern Long Island, the PINK-FOOTED GOOSE was present with Canada Geese on Sunday and Monday around the Route 105 and Sound Avenue intersection north of Riverhead. This is the same general area but a little east of last week's site, which was closer to Roanoke Avenue. The New York City BARNACLE GOOSE has been seen consistently since last Saturday in the northeast section of Randall's Island, usually either in the creek adjacent to Field 44 or feeding with Canada Geese on the ball fields themselves. A RED-NECKED GREBE and an ICELAND GULL were also noted there Sunday. 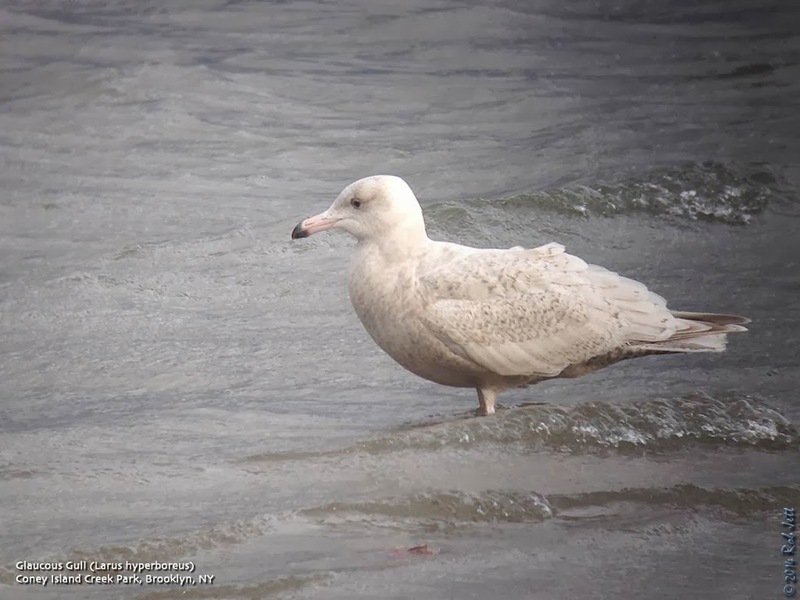 Two ICELAND GULLS were seen along the East River off mid-town Manhattan on Sunday. The elusive Jones Beach West End NORTHERN SHRIKE was spotted Wednesday off the northwest corner of Lot 2, the bird probably spending much of its time between this Lot and the inlet jetty. A LAPLAND LONGSPUR was with HORNED LARKS on the field next to the pavilion near the Coast Guard Station on Wednesday, and across Jones Inlet at Point Lookout birds during the week included a couple of HARLEQUIN DUCKS continuing around the inlet or ocean jetties, an immature ICELAND GULL Saturday, the WESTERN WILLET again Wednesday, and the ORANGE-CROWNED WARBLER again around the Fireman's Park on Monday. Out at Shinnecock, where things remain active, the immature BLACK-HEADED GULL was seen in the inlet again Thursday. Also around the inlet female and immature male KING EIDERS continue in the Common Eider and mixed Scoter flocks there and GLAUCOUS and ICELAND GULLS continue to frequent the inlet area, feeding or roosting with the many Gulls there, these joined by two BLACK-LEGGED KITTIWAKES last Saturday, when a RED-NECKED GREBE was also seen. Dune Road west of the inlet has also produced AMERICAN BITTERN, CLAPPER RAIL, and NELSON'S and SEASIDE SPARROWS this week. Four GREATER WHITE-FRONTED GEESE were present at the south end of Cold Spring Harbor off Route 25A last Saturday, and another has been visiting Wertheim National Wildlife Refuge in Shirley the 23rd to at least Tuesday, seen near the bridge over the Carmans River. Drake EURASIAN WIGEONS were also noted at Massapequa Preserve Wednesday, Santapogue Creek in West Babylon on Saturday and off Pelham Bay Park in the Bronx last weekend. A young male KING EIDER was off Long Beach in Smithtown Saturday and two CACKLING GEESE have been roosting overnight on Playland Lake in Rye, Westchester County, recently. RED-HEADED WOODPECKERS continue at Greenwood Cemetery Brooklyn, Pelham Bay's Turtle Cove, and Croton Point, with another north of the lake in Kissena Park Queens on Wednesday. Two BALTIMORE ORIOLES continue around the Ramble feeders in Central Park, and BALD EAGLES are now along the Hudson River in good numbers. To phone in reports on Long Island, call Tony Lauro at (631) 734-4126, or on weekdays please call Tom Burke at (212) 372-1483. 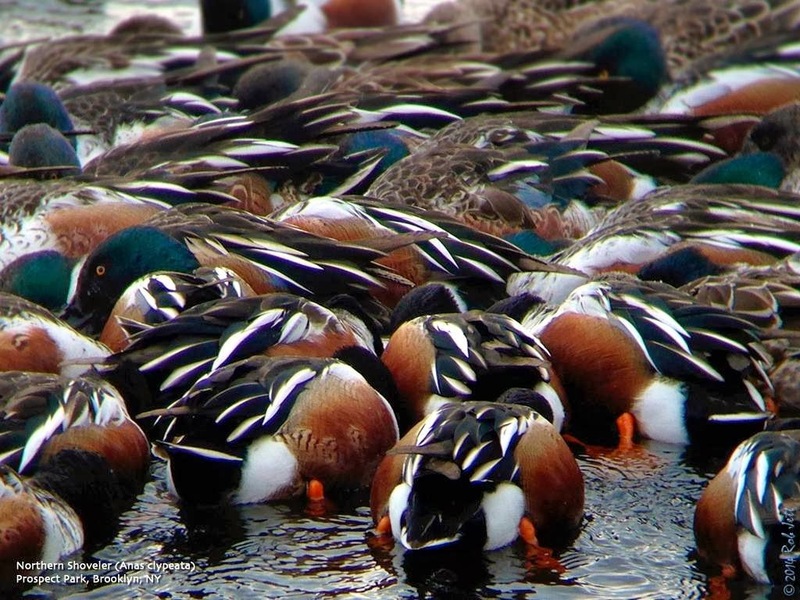 Unlike other dabbling ducks, the Northern Shoveler has a highly specialized bill that is edged with dozens of fine, comb-like projections. This adaptation allows them to skim the surface of the water, straining out invertebrates and seeds for food. This process is not unlike how some whales use baleen to filter food from the water. So if you spot a flock of these waterfowl in tight formation, spinning around with their faces in the water, don't worry, they aren't drunk, just hungry. Data visualizer "Earth" has a great interactive website for viewing various layers of Earth phenomenon. This is an animated gif of the current "Polar Vortex" gripping much of North America. Check out the website here. As I approached the nest near 3rd Street I noticed that just about every squirrel nearby was hunkered down in the trees and squeaking out their short, humorous warning call. It quickly became obvious why they were upset. 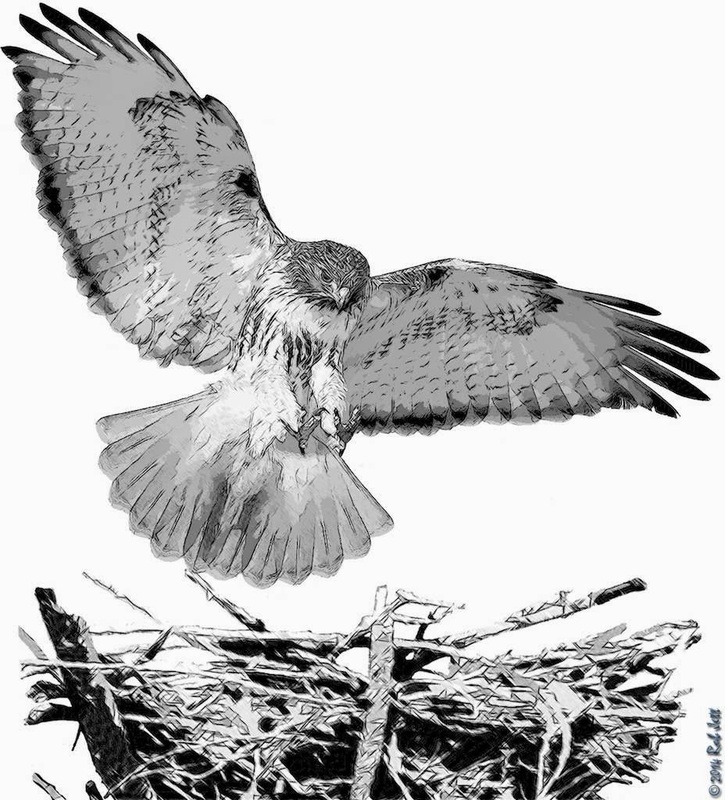 The female Red-tailed Hawk was in the nest doing some serious housekeeping. She gnawed on a small branch growing up through one side of the nest but was unable to completely remove the annoying piece of wood. Since my last visit they've add much material to the nest and it's beginning to look like a more substantial structure. As I watched the female arranging some of the sticks I heard the male make a high, short chirping call from somewhere close by. I eventually spotted him perched in a maple tree about fifty yards from the nest. As he called I noticed that he had a white rat under one foot (probably someone's lost pet). He called a few more times and then flew into the nest and offered the rat to his mate. They held both their heads down and I assumed that they were sharing the rodent but after a few minutes the female flew from the nest carrying the uneaten rat. I noticed the bulge of a full crop so I figured that maybe she wasn't hungry. She came to rest in a large oak tree a short distance from the nest and just stood there with her "gift" on the branch a few inches to her right. The male flew over, perched in an adjacent tree, and faced her from about a yard away. And they just sat there. I wondered what was going through their minds. They seemed almost disinterested in each other but their close proximity and the fact that they were face to face was curious. After about fifteen minutes the male hawk flew into the same tree as the female but remained on the opposite side of the trunk from her. A few minutes later he flew over to her and they sat, shoulder to shoulder, with the white rat offering draped over the branch. I suppose she was impressed with the gift because after about five minutes the male hopped up on her back, consummated the relationship and then flew off in search of more food. My birding over the past weekend saw a change in venue, as well as, a search for another rarity that showed up along Brooklyn's coast. On Saturday I was booked to lead a trip for the Linnaean Society of New York, so would miss anything unusual found in my home borough. This 136 year old non-profit organizes regular field trips around the tri-state area and free monthly presentations at the American Museum of Natural History. I usually lead 4 - 6 trips for them a year to various locations. Over the weekend I led a group of 16 people around Pelham Bay Park and surrounding environs. The weather was blustery and the windchill seemed to be magnified as we gathered up our gear on the open, frozen expanse of the parking lot in front of Orchard Beach. As we began our walk into the forested Hunter Island, however, the windbreak and scenic, snow covered trails seemed to quickly warm people up. The North and South pine groves on the island were extremely quiet, with very few birds seen or heard. Small, scattered flock of mostly White-throated Sparrows were the dominant bird species that we encountered. This area is known for overwintering owl species, but none were found here. I continued our hike around to the south-east side of the island to a small cove in search of waterfowl. The cove between Hunter Island and Twin Island (neither of which are actually islands as the water between was filled in long ago) was mostly frozen, but the northern edge and the area closer to the tiny Cat Briar Island was ice free and loaded with birds. Like Brooklyn's Dead Horse Bay, during most winters large numbers of scaup gather here and Saturday was no exception. There were smaller numbers of Brant. As we scanned, then rescanned the raft of feeding ducks we slowly began finding other birds - Gadwall, American Wigeon, Bufflehead, Common Goldeneye, Hooded Merganser and Red-breasted Merganser. A few minutes into our search, Matthieu Benoit, who was standing immediately to my right, said, "I've got a Eurasian Wigeon!" I followed his directions to the bird so I could get everyone in the group on it and in the process, stumbled on two Redheads. Both of these scarce and stunning species are highly sought after by birders in the winter. From the cove we headed over to the beach and up to the north end of the boardwalk to scan the Long Island Sound. We were completely unprotected from the wind at this point, so only lasted a few minutes before surrendering to the cold and heading back to the parking lot. Along the way I spotted a Merlin flying passed that cooperatively perched in a tree, giving everyone good looks at this compact, aggressive falcon. Searching the stands of conifers around the historic Bartow-Pell Mansion turned up only a short list of the expected winter birds and no owls. There were signs in the snow that this area was frequently used by deer. Wild Turkey can sometimes be seen here, as well, but not this past Saturday. I was nearly out of ideas for where to search for owls when I remembered a spot related to me by one of the local birders. I had never been there before and was navigating by his description. When I saw a stand of conifers in the distance, I knew we were going in the right direction. 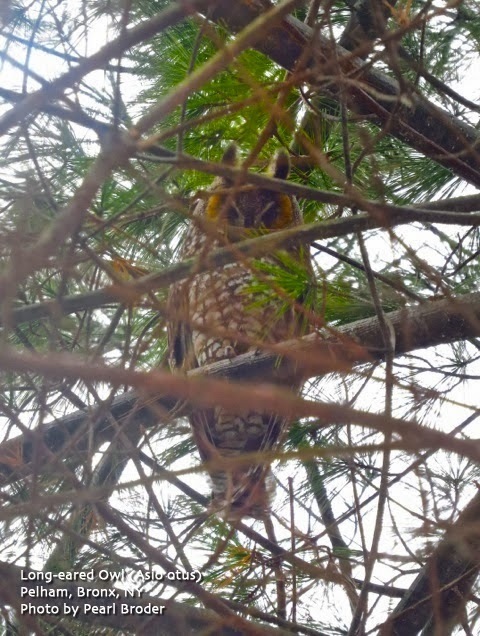 Quietly scanning the trees for white-wash, it only took a few minutes before we located a lone Long-eared Owl asleep near the top of a pine tree. I had reminded everyone to be extremely quiet and respectful of this nocturnal bird, but it was clear he was wide awake and not pleased. After a minute, I waved the group over and we left him in peace. 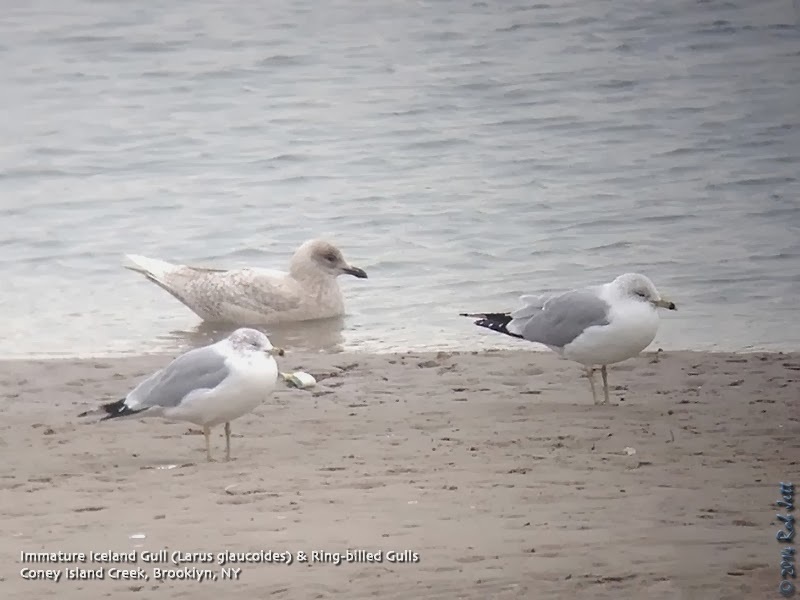 After my birding buddy Heydi and I found an Iceland Gull at Coney Island Creek on Sunday, January 19th, we began speculating on the next rare gull to be found in Brooklyn this year. We decided that it was going to be a Mew Gull, but that we would have to wait for our friend Shane to return from Texas before it was found. Shane is one of the top birders in New York State and seems to have a knack for finding rarities. He is extremely skilled when it comes to gulls and in 2010 found a Mew Gull in a flock of Ring-billed Gulls along the promenade at Gravesend Bay. He was currently working in Texas, but wrote me that he was returning Tuesday. While Heydi and I were half-joking about him finding a rare gull on his return, nobody really should have been surprised when he texted that Thursday that he was looking at a Common Gull at the Veterans Memorial Pier. Note that Common Gull and Mew Gull are common names for the species. The Common Gull (Larus canus canus) is the European and Asian subspecies and the Mew Gull (Larus canus) is the North American "flavor" found along the Pacific coast. 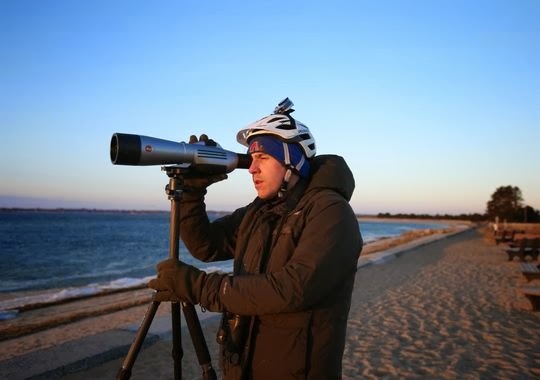 Needless to say, while I was leading birders around the Bronx on Saturday, dozens of folks were enduring frostbite conditions on a fishing pier in Brooklyn while searching for Shane's Common Gull. The pier is adjacent to a water treatment plant, which attracts large numbers of gulls, primarily the very similar Ring-billed Gull. While leading my group, I tried unsuccessfully to ignore the tweets coming into my phone with updates about the gull. It was eventually relocated and photographed by several people, determining my schedule for the next morning. I only had a few hours available to look for the Common Gull on Sunday morning. My plan was to walk from the 59th Street R train station to the 58th Street pier adjacent to the Brooklyn Army Terminal. This spot is only a short distance to the north of the Veterans Memorial Pier and also where large flocks of gull roost in the winter. If the gull wasn't there, I'd walk to the other pier and hope for the best. The weather on Saturday was a cakewalk compared to Sunday morning. The 58th Street pier was closed to the public, so instead I walked one block to the north to a dead end street overlooking the water. The wind was blowing directly off the water and caused my one open eye to tear up as I looked through my scope. There was nothing here, so I slung my tripod over my shoulder and started walking the 1.25 miles to Veteran's Memorial Pier. Along the way I reminisced with my birding buddy about the last time I was out in such brutal winter weather. It was early January 2011. That winter a rare Black-headed Gull was making semi-regular appearances on the pier, but Heydi's timing was off and she kept missing it. We made one final try during a morning when arctic blasts were chilling the entire Northeast. Thankfully, the bird was there, we quickly took some photos, then trudged off to thaw out somewhere far from the water. As we were leaving we spotted a lone birder heading towards the pier. 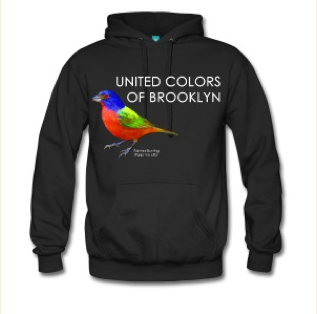 With only his eyes showing through his hood and scarf was Queens birder, Jeff Ritter. We spoke briefly, I pointed him towards the bird, wished him well and hurried off to get warm. On Sunday morning the gulls on the pier, with few exceptions, were ring-billeds. Periodically a few would come and go from the adjacent water or water treatment plant, but nothing unusual was seen. I tried to stay out of the wind by standing behind a 25 foot tall bronze memorial shaped like a speaking trumpet. It did little to temper the cold and wind. My heavy winter boots can usually protect my toes from the coldest weather, but after standing on a pier that was suspended above gale force wind churned waters for 45 minutes, the insulation's effectiveness was wearing off. We decided to call it quits and packed up our gear. As we walked off the pier and towards Bay Ridge Avenue, a birder was heading our way. Unbelievably, it was Queens birder Jeff Ritter. We looked at each other, laughed and he said, "Haven't we done this before?" This was only the second time that I've EVER seen him at the pier. Maybe next weekend I'll find the Common Gull and, hopefully, it will be a bit warmer on the water. The mysterious mass die-offs of honeybees that have wiped out roughly a third of commercial colonies each year since 2006 may be linked to a rapidly mutating virus that jumped from tobacco plants to soy plants to bees, according to a new study. The research, reported Tuesday in the online version of the academic journal mBio, found that the increase in honeybee deaths that generally starts in autumn and peaks in winter was correlated with increasing infections by a variant of the tobacco ringspot virus. The virus is found in pollen that bees pick up while foraging, and it may be spread as the bees mix saliva and nectar with pollen to make “bee bread” for larvae to eat. Mites that feed on the bees may also be involved in transmitting the virus, the researchers said. Among the study’s authors are leading researchers investigating the bee deaths at the Agriculture Department’s laboratories in Beltsville, Md., as well as experts at American universities and at the Chinese Academy of Agricultural Sciences in Beijing. Their research offers one explanation for the phenomenon known as colony collapse disorder, in which bees have died at more than twice the usual rate since it was identified seven years ago. But most researchers, including the study’s authors, suspect that a host of viruses, parasites and, perhaps, other factors like pesticides are working in combination to weaken colonies and increase the death rate. Honeybees are crucial to the production of crops that make up a quarter of Americans’ diet, the Agriculture Department says, and pollination adds about $15 billion to the crops’ value each year. The infection of bees by the tobacco ringspot virus, spotted by chance during a screening of bees and pollen for rare viruses, is the first known instance in which a virus jumped from pollen to bees. About one in 20 plant viruses is found in pollen, the researchers wrote, suggesting that pollen should be monitored as a potentially significant source of host-jumping infections. The tobacco virus is an RNA virus: usually a single strand of genetic material that mutates faster than other pathogens and so is adept at devising workarounds to its hosts’ defenses. In humans, diseases caused by RNA viruses include AIDS, influenza and some strains of hepatitis. That rapid mutation rate also allows RNA viruses to switch hosts more rapidly than conventional pathogens, with the tobacco virus jumping to bees just as influenza has leapt to humans from pigs and chickens. The tobacco virus is believed to attack honeybees’ nervous systems. Monitoring 10 colonies kept at the Agriculture Department’s Maryland laboratories, researchers found that the share of bees infected with the virus rose to 22.5 percent in winter from 7 percent in the spring. In weak colonies — those heavily infected with tobacco ringspot or other viruses — deaths began rising sharply in late autumn. Researchers said the strong colonies that survived the winter showed no trace of either the tobacco virus or a second one, Israeli acute paralysis virus, that may also play a role in colony collapse disorder. Meet at Main Entrance Ranger Station at Floyd Bennett Field, Brooklyn, NY. Hike the trails and shorelines of Dead Horse Bay with American Littoral Society Naturalist, Mickey Maxwell Cohen, author of "Exploring the Trails of Dead Horse Bay". This hike will be over one mile in length. 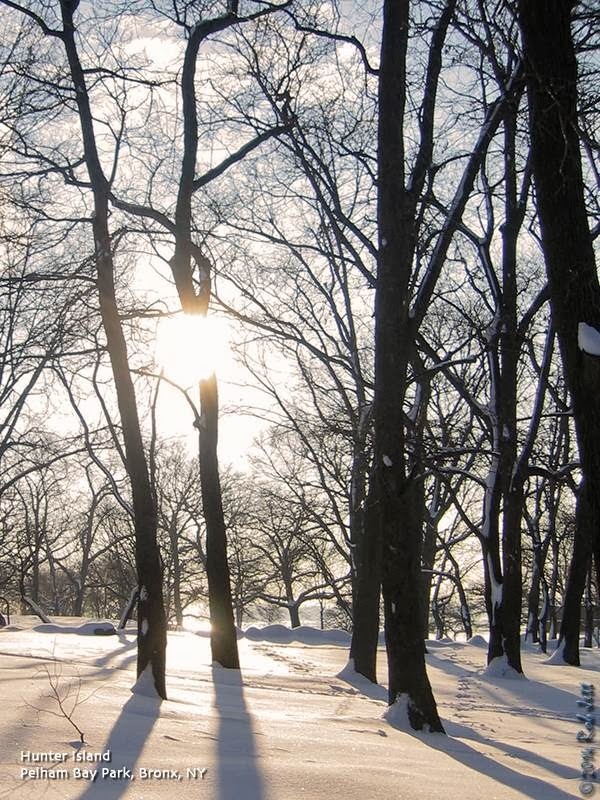 Saturday, February 1, 2014, 1:00 P. M. to 3:00 P. M.
Containing mature upland woods, swamp forest, open marsh, ponds, and shoreline on Raritan Bay, Wolfe’s Pond Park is one of the most diverse parks in the city. Meet at the comfort stations at the end of the parking lot. The entrance to the parking lot is located off of Cornelia Avenue (http://goo.gl/maps/n8XBa). For more information call John Paul Learn at 718-619-5051 or email john.paul.learn@gmail.com. Sunday, February 2, 2014, 2:00 P. M. to 4:00 P. M.
Acme Pond is a diverse ecosystem, located on the North side of Hylan Boulevard and Wolfe’s Pond Park. This walk will take us through hiking trails in some of the most idyllic woodlands in all of New York City, leading to a view of the freshwater pond. We will meet at the corner of Seguine Avenue and Herbert Street. Street parking is available on Herbert Street and in parking lots off of Herbert Street (http://goo.gl/maps/59dvC). Greetings. This is the New York Rare Bird Alert for Friday, January 24, 2014, at 6:00 pm. The highlights of todays tape are PINK-FOOTED GOOSE, GYRFALCON, MEW AND BLACK-HEADED GULLS, NORTHERN SHRIKE, GLAUCOUS GULL, BLACK-LEGGED KITTIWAKE, TUNDRA SWAN, GREATER WHITE-FRONTED GOOSE, KING EIDER and a pelagic trip reminder. Last Saturday the PINK-FOOTED GOOSE was relocated north of Riverhead, feeding with a flock of Canada Geese on the north side of Sound Avenue across from the Roanoke Vineyard, a short distance east of Roanoke Avenue. As that field is used by hunters the geese hopefully moved elsewhere, but we have no subsequent reports since Saturday. There have been no definite reports of the Jones Island GYRFALCON this week but it should be looked for, especially in the marshes, from west of Gilgo east to the area north of the Cedar Beach Marina. Though the entire extent of marshes does offer good habitat both for this bird and several PEREGRINE FALCONS using the same area. The Jones Beach West-End NORTHERN SHRIKE was reported west of the West-End 2 parking lot Thursday, and another was spotted Monday in East Hampton near the intersection of Old Town Road and Gin Lane. Also in East Hampton, two TUNDRA SWANS were still on Hook Pond, at least as long as it remained unfrozen through Tuesday, and three to five GREATER WHITE-FRONTED GEESE have been again visiting the fields along Further Lane. Shinnecock Inlet has been providing a nice selection of winter birds lately with both GLAUCOUS and ICELAND GULLS being seen there. The Iceland favors the east jetty, often feeding around its tip, while one or two GLAUCOUS GULLS are usually on the west side, often on the beach. Three female KING EIDERS and at least one young male continue at Shinnecock, usually with the Common Eiders and Scoters along the beach. On Saturday four BLACK-LEGGED KITTIWAKES joined the Gulls and NORTHERN GANNETS feeding just offshore. Then on Monday an immature BLACK-HEADED GULL was seen in the inlet. A RAZORBILL was also seen there Saturday. The best numbers for these are at Montauk Point where over 180 were counted Sunday morning. At Montauk Point they often are cycling back and forth with the Eiders and Scoters feeding off the Point, providing nice views. A BLACK-LEGGED KITTIWAKE was also at Montauk Point Sunday. Finishing up out East, a LESSER BLACK-BACKED GULL remains at Napeague at the end of Lazy Point Road and two SHORT-EARED OWLS were seen at the Calverton Grasslands, the former Grumman Airport, late Saturday afternoon. EURASIAN WIGEONS this week were noted Saturday at Veterans Memorial Pier in Brooklyn, Monday on the Oyster Bay Mill Pond, Thursday at the Sayville Country Club, and at Massapequa Preserve where Thursday a hybrid Wigeon and two WILSONS SNIPE were also present. An ICELAND GULL was at the Coney Island Creek again this week. At Jones Beach West End a LAPLAND LONGSPUR was with four AMERICAN PIPITS and some HORNED LARKS on Thursday, and RED-HEADED WOODPECKERS continued near Turtle Cove at Pelham Bay Park and in Greenwood Cemetery in Brooklyn. 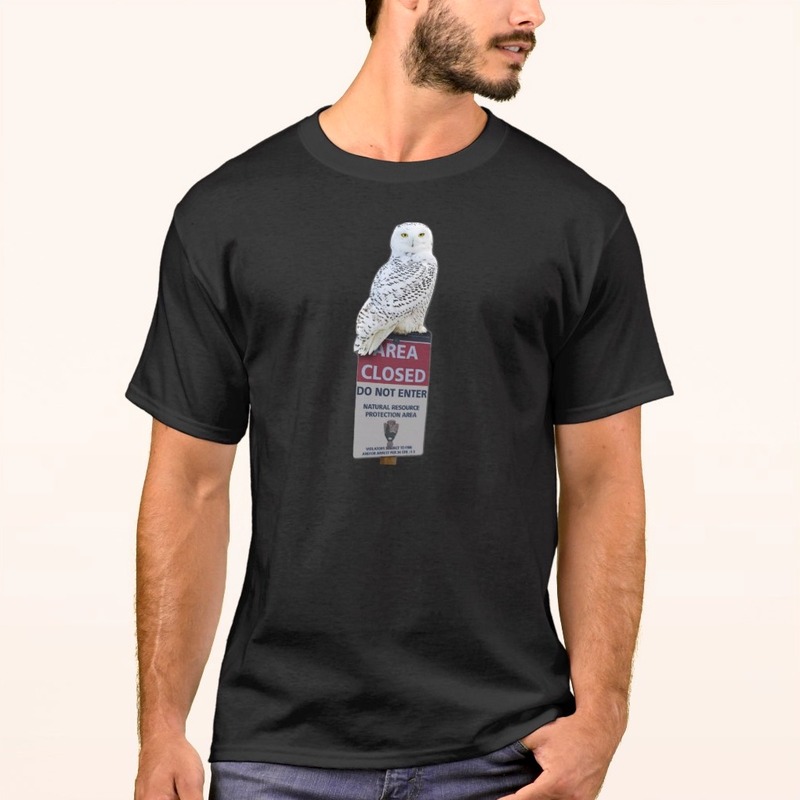 And of course SNOWY OWLS continue to grace our outer beaches and other suitable as well as some unexpected sites in our region. Dont forget to call See Life Paulagics, which is sponsoring a pelagic trip with the Captain Lou Fleet out of Freeport on Saturday, February 1st leaving at 6am. Call (215) 234-6805 for information or visit their website at < http://www.paulagics.com/site/ >. The White-winged Scoter is one of three species of large seaducks found in offshore waters around New York City in Winter. It is the largest of the three species, the other two being Black Scoter and Surf Scoter. Feeding on mollusks, crustaceans, aquatic insects and small fish, they will sometimes dive as deep as 60 feet in search of food. While an estimated annual average of 30,000 are taken by sport hunters, the International Union for Conservation of Nature and Natural Resources classify their conservation status as "Least Concern". 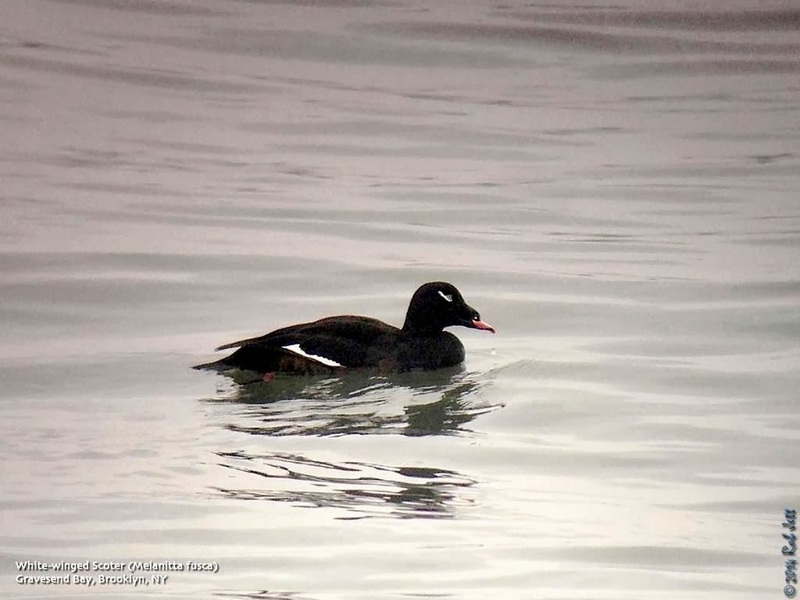 According to the "Sea Duck Joint Venture" project "about 70 percent of the Atlantic white-winged scoter population appears to winter between Long Island Sound and Virginia, with greatest numbers in Chesapeake Bay". 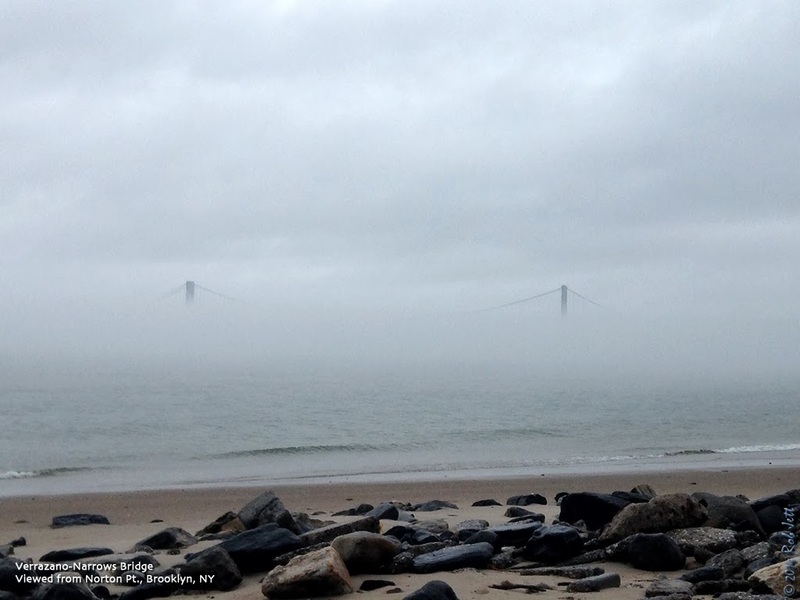 This lone individual was seen in the bay under the Verrazano Bridge. Check out Dorian Anderson's great "Biking for Birds" blog where he is attempting a North American "Big Year". While most people who do "Big Years" end up with a huge carbon footprint (cars, boats and planes), Dorian will only travel using "bike, foot, and kayak". Partnering with "The Conservation Fund" and the "American Birding Association", he hopes to raise $100,000 for conservation. 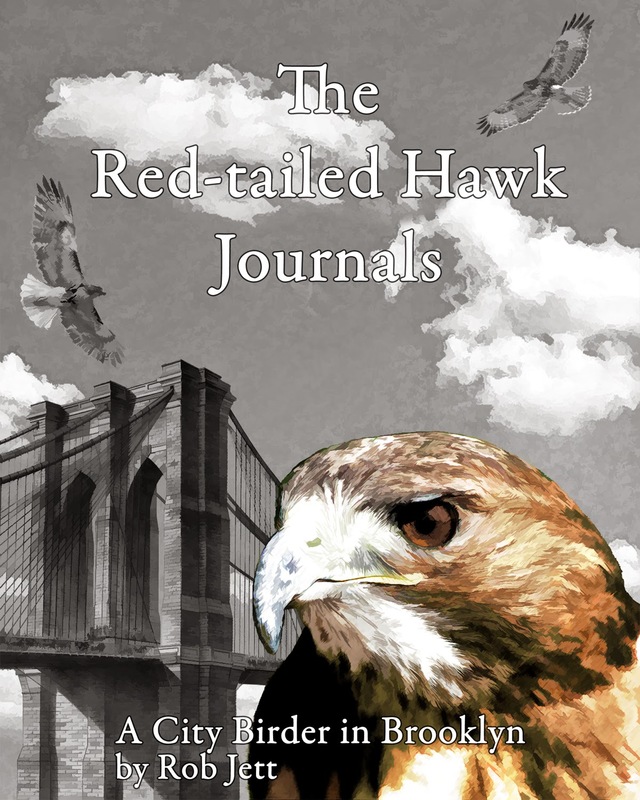 It doesn't appear that either the Prospect Park or the Green-Wood Cemetery Red-tailed Hawk pairs have laid eggs. This morning at around 10am the Prospect pair left the vicinity of the nest to hunt. I spotted one of them at around 10:30 sitting on top of a baseball backstop on the Long Meadow. Despite three crows determined to drive him off he just sat calmly and ate a small, unidentifiable animal. I am not very optimistic about the park pair for a couple of reasons. The exposed location of the nest and its rather flimsy construction seem an unlikely combination for success. Perhaps they are young birds and this is their first attempt at nesting. In Green-Wood Cemetery the more typically located and more substantially built nest was unoccupied. Both birds, however, were hunting in the area. Based on Janet Schumacher's observations yesterday, I presume that the female just hasn't laid any eggs yet. While at Green-Wood I also checked in on the Red-headed Woodpecker. When I first arrived at the stand of trees on Mulberry Avenue it was extremely quiet. Aside from the distant "chi, chi, chi" of a Red-bellied Woodpecker the area seemed desolate. I sat down and waited. After about 15 minutes a very large, immature Sharp-shinned Hawk flew out of the oaks in front of me and down the hill. Ah ha! A few minutes later the birds began returning to the area. The Red-headed Woodpecker flew into a tree nearby and looked around nervously as it probed a rotted branch. A juvenile bird, I was surprised to see how extensive its red plumage has become. Its throat, chin, crown and nape are now solid red with only a little brown left around the eyes and cheeks. It's a beautiful and very vocal bird. This past weekend may not have had the best weather conditions for birding, but as my mentor the late Marty Sohmer used to say, "Sometimes the worst weather brings out the best birds". 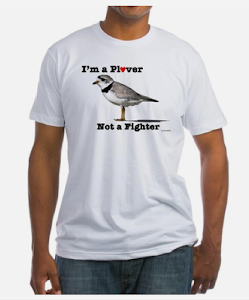 I could probably amend that to, "Sometimes the worst weather brings out the most desperate, fervid birders." I wanted to try and wrap up a full compliment of gull species in Brooklyn before the end of January. The only way to do that is to spend nearly all of my birding time at the water's edge, which meant (as usual) Coney Island and Floyd Bennett Field. There had been reports of an Iceland Gull on Coney Island Creek and that would be another excellent gull to track down for the year. Despite light rain forecast for the late morning on Saturday, I was out the door and on the "F" train to Stillwell Avenue before sunrise. I would forego my usual routine of checking the water on the South side of the peninsula first and instead head directly to Coney Island Creek. There is a small remnant of dunes and a sand spit near the mouth of Coney Island Creek across the water from Calvert Vaux Park. It is a favorite roosting spot for gulls, especially at low-tide. On Saturday, high-tide was early in the morning, so there weren't too many gulls there when I arrived. I thought that there might be more birds feeding in the channel off of Norton Point and headed down the beach hoping to find the Iceland Gull or something interesting before the rain came. It was slack-tide when I set my scope up next to the seawall at the point. The jetty that is usually visible here was completely covered by water and, in one spot, the now narrow band of beach was blocked by the tide. Bonaparte's Gulls were enjoying the relative calm waters offshore and several dozen gracefully picked food from the surface of the water. Many more of these small, delicate gulls flew back and forth in the Lower Harbor. It was probably the highest concentration of them that I've experienced in Brooklyn. There were lots of Long-tailed Ducks offshore, as well, and a single Red-necked Grebe. After nearly an hour of watching the same birds, it was time to head back to the sand spit on the creek and find the Iceland Gull. I decided I had had enough abuse, packed up my scope and bins, then trudged back to the train station. It was still dark when I walked across Flatbush Avenue from the bus stop into Floyd Bennett Field on Sunday. Mass transit was on time for a change, so I arrived a lot faster than I expected. The temperature was low enough that my breath froze on my mustache. Rather than walking the edge of the grasslands looking for raptor silhouettes, I waited inside of Aviator Sports for Heydi to arrive. The full effect of the cold didn't hit me until we walked into the wind towards the cricket field. On top of my gloves I wore a pair of convertible mittens. The mittens are fingerless gloves with a mitten flap that pulls over the top. Normally, this double layer is a really warm combination. On Sunday I'm pretty sure that only electric heated gloves would have kept my fingers from freezing. Anyway, we tolerated the wind long enough to count 66 Horned Larks feeding on the cricket field, then walked to the leeward side of the berm East of the field for a brief respite. We walked the edge of the grasslands, checked the small grass field next to the community gardens, explored the pine groves and scanned the bay off of Archery Road. The wind was coming out of the West so would be blasting directly into Dead Horse Bay. I thought it would be a good idea to skip that area. By 10 o'clock I decided to head over to Coney Island Creek and find me some gulls. There were lots of gulls on the creek and adjacent field and running track of Leon Kaiser Park. The vast majority were Ring-billed Gulls, in fact, there were probably 2,000 just on the field alone. We set up our scopes at a high point on the dunes where we had a good view of the creek, the sand spit and Gravesend Bay. A cursory scan of the gulls didn't turn up anything unusual to the East, so we walked a short distance towards the bay and began scanning the birds standing on the sand and bobbing in the water. "Raven harassed by two peregrines behind Gravesend Bay middle lot"
"thanks, scoped both birds from across the bay!" "Iceland gull at Coney Island Creek on sand spit"
It seemed like less than a minute had passed when we received a text from Keir saying that they were looking at our Iceland Gull. Huh? We looked around and didn't notice anyone, then realized that Keir, Tom Preston and Tom Stephenson were about 75 yards to our right, but blocked from view by some shrubs and a stand of phragmites. I headed home shortly after that, not only happy that I'd found the Iceland Gull, but also that a small group of us had been able to quickly share our sightings. It's hard to believe, but before smartphones, birders had to wait until the following Friday, when the Rare Bird Alerts came out, to find out what birds were being seen around their area. What will be the next technology that birders will adopt? Skype scopes? 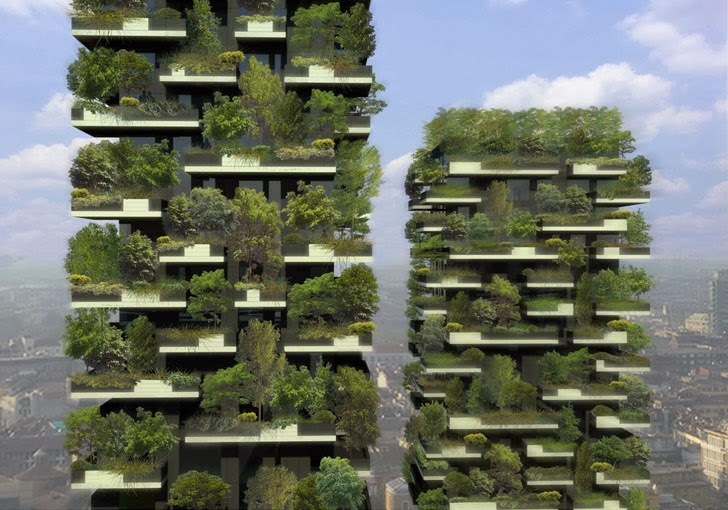 Italian architect Stefano Boeri's vision of a "vertical forest" in Milan nearly complete. At first glance it looked too fantastical to be real, but now the completion date for the world’s first vertical forest is drawing near. Located in Milan, Bosco Verticale is Boeri Studio’s answer to the question of how to make cities greener while supporting an ever denser urban population. Since Inhabitat first reported on the project in 2011, it has captured the imagination of many across the globe, all eager to see how the benefits of downtown city living can be enhanced within a vertical forest environment. Inhabitat spoke to Boeri Studio this January for an update and some photos of the building’s progress. Keep reading to get the latest. New photographs start to show the appearance of the finished residential tower blocks now that most of the scaffolding has been dismantled. Most of the 100 different species of trees and shrubs are in place, surrounding the external cladding. You can begin to imagine relaxing high up above the city amongst the dappled sunlight breaking through the leaves, breathing the fresh air, filtered by the forest microclimate, deep into your lungs. Completion is expected by late spring/early summer 2014 and an application for LEED Gold certification has been submitted. On flat land, each building has the capacity to hold, in amount of trees, shrubs and ground cover plants, an area equal to 10.000 sqm of forest. This includes 480 large and medium size trees, 250 small size trees, 11,000 groundcover plants and 5,000 shrubs. Greywater recycling will water the vegetation and integrated photovoltaic panels will provide power. In terms of population, each tower supports the equivalent population of an area of single family dwellings of nearly 50,000 sqm. The smallest apartment is 65 sqm and includes a small woodland terrace. The largest apartment is around 450 sqm with a terrace of around 80 sqm. The architects are looking forward to the next phase when the engineers, builders, masons, lawyers and electricians finish their work and residents begin new lives within the project. Every plant has been chosen by botanists to thrive in it’s particular orientation and microclimate within the structure. Moreover, a specialized maintenance company will keep the vertical forest in good health in the years to come. Dolce Vita Homes have worked in collaboration with Coima Image to design the interior specifications of the apartments. Residenze Porta Nuova have begun marketing the apartments and you can have a peek at the brochures already. Saturday, January 25, 2014, 9:15 a.m. to 4:00 p.m.
Come join others who enjoy a cold day outdoors. Ten moderate miles at a comfortable pace. We meet at the entrance to Deere Park at the end of Staten Island Blvd. behind the Petrides School. Bring lunch and beverage and sturdy walking shoes. Dress warmly in layers. We go in all weather but walk is shortened if high pollution levels occur. Come see what the winter woodland has to offer: winter birds, bare forest trees, frozen ponds, evergreens and possibly some snow cover to detect deer visits, and always beautiful vistas. Saturday, January 25, 2014, Noon to 2:00 P. M.
During a one and a half mile hike through the woodlands of Long Pond Park we will observe evidence of the geologic history and human influence on the park as well as look for evidence of wildlife in the park. Deer are common in the Long Pond area and this is the time of year that their antlers are being shed. Meet at PS 6, on Page Avenue and Academy Avenue about 3 blocks northwest of Hylan Boulevard. Greetings. This is the New York Rare Bird Alert for Friday, January 17th 2014 at 7pm. The highlights of today's tape are GYRFALCON, PACIFIC LOON, PINK-FOOTED GOOSE, GREATER WHITE-FRONTED GOOSE, BARROW'S GOLDENEYE, BLACK-HEADED GULL, NORTHERN SHRIKE, YELLOW-HEADED BLACKBIRD and a pelagic trip announcement. The only report this week of the gray GYRFALCON was from the recently closed Cedar Beach Marina. The bird well out in the marsh at midday Sunday. This site is at the eastern end of its currently known range with the otherwise most recent sightings from Gilgo about 4 miles to the west. A lot of territory to cover but check the Osprey platforms especially as you cruise Ocean Parkway realizing that there are also a few Peregrines using these as perches. Some nice rarities out on eastern Long Island started Saturday with a PACIFIC LOON spotted well off Culloden Point in Montauk joined there by a female KING EIDER and a RED-NECKED GREBE. Then on Sunday a YELLOW-HEADED BLACKBIRD was seen again at the Buffalo Farm at the southwest corner of Roanoke Avenue and Reeves Avenue north of Riverhead. This same area on Thursday produced a PINK-FOOTED GOOSE in a Canada flock in a field on the eastern side of Roanoke just south of Sound Avenue. The goose ultimately flying south. Today the PINK-FOOTED GOOSE was present with Canadas on the Buffalo Farm but viewing the geese there from the public roads is very difficult and the PINK-FOOTED was not seen until it took off with Canadas and flew away. TUNDRA SWAN was also noted in the Roanoke fields and 2 were seen again on Hook Pond in East Hampton today. Also in the Montauk area last year's pair of BARROW'S GOLDENEYE have returned to Lake Montauk being seen Sunday and after at the south end of the lake as viewed from South Lake Drive. 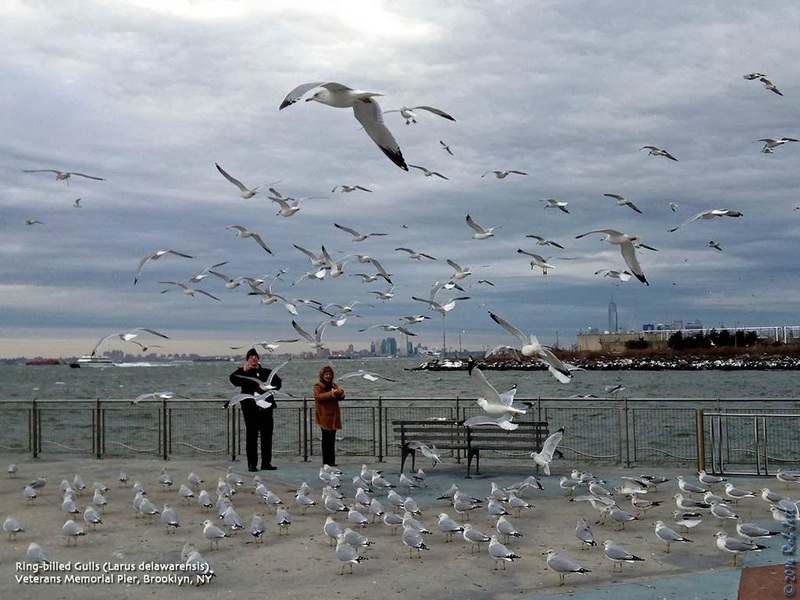 The sightings of adult BLACK-HEADED GULLS this week took place near Coney Island Creek in Brooklyn on Saturday perhaps the same bird at Breezy Point Sunday and one in Little Neck Bay Thursday afternoon. Coney Island Creek this week also produced single GLAUCOUS, ICELAND and LESSER BLACK-BACKED GULLS. Early Sunday morning at Jones Beach West End NORTHERN SHRIKE appeared atop a tree on the western side of the swale in front of the West End lot 2 pavilion and then flew west sitting up on a couple of Junipers and adjacent trees well out towards the West End jetty. The darkly pigmented adult ICELAND GULL was in the West End 2 parking lot Sunday. Over at Point Lookout 7 HARLEQUIN DUCKS continue around the inlet or ocean jetties and another visited northeastern Staten Island yesterday and today. Birders looking for a GREATER WHITE-FRONTED GOOSE reported from Bergen Point Golf Course in West Babylon on Sunday found a drake EURASIAN WIGEON and a SNOWY OWL there and perhaps the same GREATER WHITE-FRONTED GOOSE was present late Sunday at Heckscher State Park field 7. There have been no recent reports of the Belmont Lake State Park BARNACLE GOOSE but birders should keep looking. Other EURASIAN WIGEON have been in Brooklyn near the Verrazzano Bridge Saturday and on Staten Island. RED-HEADED WOODPECKERS continue at Green-wood Cemetery in Brooklyn, Turtle Cove in Pelham Bay Park and at Croton Point. At Shinnecock Inlet a few KING EIDER, a GLAUCOUS and ICELAND GULLS continue. Among several other ICELAND GULLS have been birds at Breezy Point, Artist Lake in Middle Island and Iron Pier Beach in Northville. The GREATER WHITE-FRONTED GOOSE was noted at Hedges Lane in Sagaponack on Wednesday and a CACKLING GOOSE has been along Center Shore Road in Centerport recently. At Montauk Point during the past week around 20 RAZORBILLS and one or two BLACK-LEGGED KITTIWAKES have been noted. The LESSER BLACK-BACKED GULLS have been at Montauk Harbor Inlet, Fort Pond and Napeague. RED-NECKED GREBES have also been well scattered. See Life Paulagics is sponsoring a pelagic trip with the Captain Lou Fleet out of Freeport on Saturday, February 1st leaving at 6am. This should be a good trip and spaces are available. Call (215) 234-6805 for information or visit their website at < http://www.paulagics.com/site/ >. Glaucous Gulls are not typically found around Brooklyn. This first year bird, though, has been seen fairly frequently this Winter around Coney Island. Breeding in the Arctic regions of the northern hemisphere, it is the immature birds that are sometimes found well South of their normal, high Arctic range. They are omnivorous, eating mostly animals including other seabirds, but will also scavenge and pirate food from other birds. Continuing my theme of exploring Brooklyn's coastal habitats for interesting Winter birds, last weekend I spent time at Coney Island, Floyd Bennett Field and Dead Horse Bay. Although Saturday's weather was comically abysmal, it did yield one very nice bird. Years ago I would never have thought about looking at "seagulls"*, but have come to appreciate this family of bird's wide range of size, shapes, plumages and behaviors. Given the somewhat steep learning curve, as well as the fact that the best gulling is sometimes carried out during the worst Winter weather here in the Northeast, I guess it is an acquired taste, like caviar or raw oysters. Although, if you attempt to eat the aforementioned while sitting on a beach with several thousand gulls you might make a whole lot of new best friends. In any case, much of my Winter birding of late has been in search of rare or unusual gulls. Saturday morning's pleasantly mild temperatures were a nice change from the week's "polar vortex" arctic chill that numbed New York. The downside was that we awoke to a thick curtain of fog blanketing nearly the entire city. 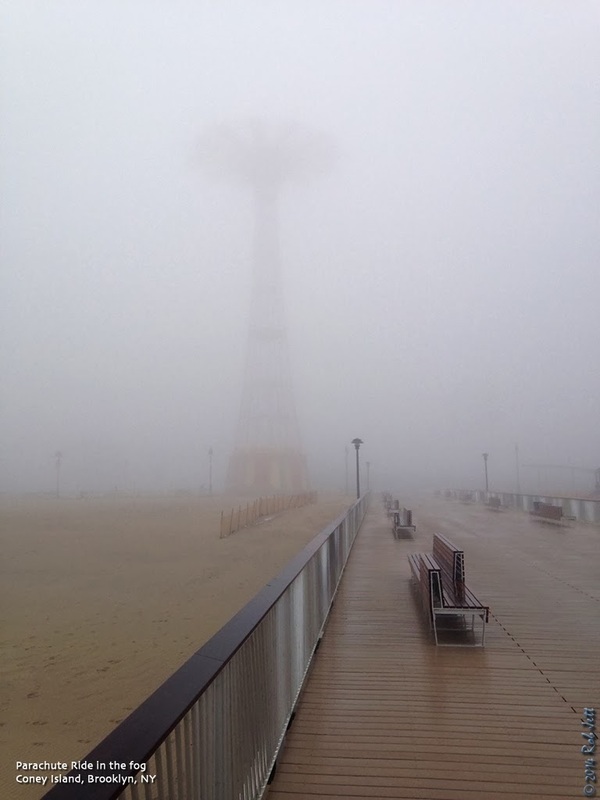 I decided to head down to Coney Island anyway, assuming that the fog might bring some birds off the ocean and close to shore. I also figured that the fog would eventually lift revealing lots of amazing birds...maybe. If the birds never materialized, I'd at least get to take some photos of the surreal, horizonless landscape created by the haze. My birding buddy, Heydi, met me at the Stillwell Avenue train station where we planned out our agenda for the morning at Dunkin' Donuts. Low-tide wouldn't be until around 10:30am, so we'd have plenty of time to bird along the South side of the peninsula, then head up to Coney Island Creek and around to Norton Point on Gravesend Bay. I've found that the strong currents in the Ambrose Channel off of the Western end of the Coney Island peninsula attracts a great diversity of Winter birds. Perhaps we'd spot something unusual. There are a few regular gull roosting areas on the sand between the fishing pier and the Western jetty near Seagate. One can usually encounter a couple of thousand gulls here along the 1 mile walk, but for whatever reason, there were very few. I wondered out loud where they were all hiding. The conditions on the North side of the peninsula were better only in that we were out of the wind. Like our experience along the beach side, there were very few gulls present. Foolish optimism had us pushing on, however, and we walked the approximately 1/2 mile West to Norton Point. There were a few of the expected gulls on the jetty, as well as, many Long-tailed Ducks, a few Red-breasted Mergansers and a single scaup close to shore, but nothing unusual. On a patch of grass above the seawall behind us a small flock of Snow Buntings foraged in the stubbly grass. We decided to persevere and wait for the fog to lift, which it did very briefly. At 10:10am the sky brightened and the fog lifted to the point were we could see several ships anchored in the lower harbor and the tops of the Verrazano Bridge towers floating above a thin layer of fog. We were taking some photos of the unusual conditions when I noticed a gull flying along the edge of the water coming from our right. I thought it was a Bonaparte's Gull, but as it got close I saw a red bill and casually mentioned that it was a Black-headed Gull. The bird passed within 15-20 yards of us, Heydi managing to shoot a couple of record photos. The bird was closely following the shoreline around the point, flying into the wind roughly South-East, then East and out of view. This rare European visitor to North America shows up periodically along coastal New York State. The last time I saw one in Brooklyn was in January 2011. I posted about it here. You can see some of Heydi's rare bird photos here. The fog never completely cleared on Saturday and we felt lucky to have found the Black-headed Gull during the short lived respite. From Coney Island we headed off to Floyd Bennett Field with visions of rare birds in our moisture addled brains. Most birders drive they cars around the expansive habitats of Floyd Bennett, but Heydi and I usually walk the entire park checking the grasslands, remnant pine forest, scrub habitat of the "North Forty" and coastal waterfront for anything and everything. Our latest mission has been to find Lapland Longspur or Rough-legged Hawk around the grassland and Eurasian Wigeon or eiders in the water. Across Flatbush Avenue, at Dead Horse Bay, the ever-growing scaup raft keeps us coming back in search of something unusual hiding among the field of bobbing black, white and brown waterfowl. Despite our tireless resolve, we only managed to tally mostly just the expected species of Winter birds (which is actually not too bad if you scan down the list below). Maybe this weekend Brooklyn's wildlife will surprise me with something unforeseen. If you follow my Twitter feed, I promise you'll be the second to know. *Note: There is no such thing as a "seagull" other than Jonathan Livingston Seagull. This morning I watched a pair of Red-tailed Hawks working on a nest in an unlikely location. As you enter Prospect Park at the 3rd Street entrance there is a playground just to your right. On the hill above it sits the Litchfield Villa, home of the park’s administrative offices. If you continue past the playground towards the interior of the park to the loop drive you'll reach a traffic light and pedestrian crosswalk. Without crossing the road look across the street. About 7' from the left edge of the crosswalk and 7' from the curb is a young Linden Tree. The hawks are building their nest in this tree only about 25' above the roadway. The Linden Tree is located within a narrow north-south ribbon of woods bounded to the west by the park’s interior road and to the east by the sprawling Long Meadow. Through the strip of woods and parallel to the roadway is a dirt path created by thousands of runners, walkers and cyclists who prefer trees and squirrels to asphalt and automobiles. Beginning at the north entrance of Prospect Park, the Long Meadow stretches eighteen blocks south along the west side of the park. The forests of Payne Hill and Quaker Ridge mark the field’s eastern border. Like the surface of an ocean low, gentle rolling hills on the north section gradually swell in size and pitch as the meadow flows south. Whitecaps of mature oaks, elms, maples and lindens crown the taller waves. The meadow gradually flattens out at its extreme southern end and transforms into the flat, sandy infields of baseball diamonds. Both the male and the female hawks returned to the nest repeatedly with various sized twigs and sticks. They would meticulously weave the new piece into the nest after carefully assessing the ever-growing structure. 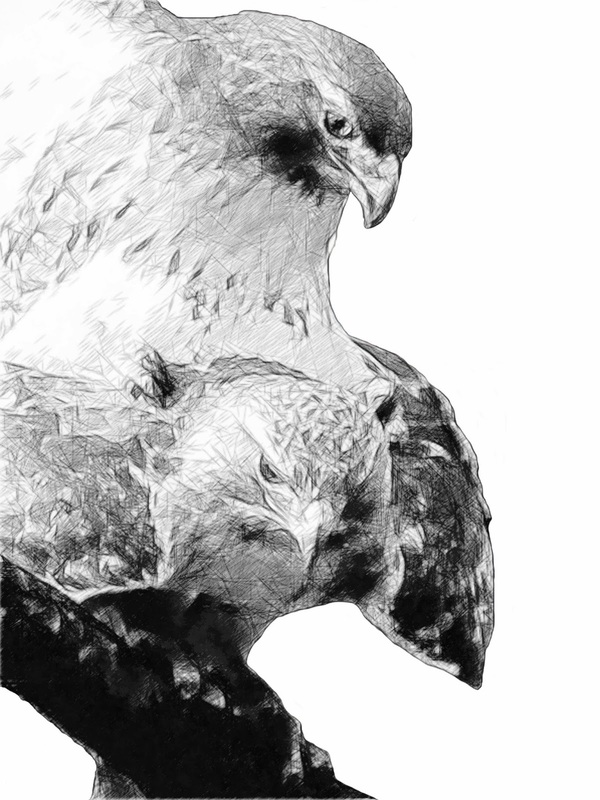 Sometimes the hawks would fly a short distance to one of the trees bordering the road in search of building material. Sometimes they'd fly off and I wouldn't see either bird for 10 minutes or more. I tried to find some identifying marks on the birds but could only tell them apart when they were side by side. The female (presumably) was noticeably larger than the male and the males tail looked a little tattered. I watched as the female hawk looked for branches only a few yards from me. She'd use her talons to step on a small branch and if it didn't easily break, she'd try another one. One time she tipped her head to check out the possibilities above her. Stretching her neck out, she used her bill to snap off a branch and then flew back across the road to the nest. Hundreds of pedestrians, runners, rollerbladers and cyclists must have passed under the "construction zone" but only four people actually noticed the hawks. Those folks were excited and extremely curious about hawks in the park and I gladly shared my limited experiences with them. Check out her blog here or her book here. **Note: the destination of this trip may vary depending on the unpredictable whereabouts of winter visitors; we will generally go where the birds are! Click here to register! Guide: Gabriel Willow With Wave Hill Meet at the Perkins Visitor Center. Naturalist Gabriel Willow contributes his extensive knowledge of bird species and their behaviors on these captivating walks. Wave Hill’s garden setting overlooking the Hudson River flyway provides the perfect habitat for resident and migrating birds. Ages 10 and up welcome with an adult. Reservations recommended; register online at www.wavehill.org, by calling 718-549-3200 x305, or at the Perkins Visitor Center. Severe weather cancels; for updates call 718-549-3200 x245 by 8am the day of the walk. NYC Audubon members enjoy two-for-one admission. Saturday, January 18, 2014, 10:00 a.m. to 2:00 p.m.
Meet in the Greenbelt Nature Center parking lot at Rockland Avenue and Brielle (additional parking at the Recreation Center nearby). We will remove invasive shrubs and vines from along the Blue Trail close to the Department of Parks restoration project at Rockland Avenue. Protectors will supply tools, gloves and refreshments. After a two hour work session (our 209th monthly workshop), we will take a short walk over nearby trails. Saturday, January 18, 2014, 1:00 P. M. to 3:00 P. M.
With its bluffs nestled 85 feet above sea level, Mt. Loretto is home to beautiful vistas of the shore facing the Raritan Bay. The shoreline is home to some of Staten Island’s most unique natural artwork. Nestled in the meadow’s hills are a variety of plants and wildlife. Mt. Loretto is a habitat for harbor seals, monarch butterflies, wild rabbits, muskrats, ospreys and on occasion, bald eagles. Meet at the parking lot at Cunningham Road and Hylan Boulevard. (http://goo.gl/maps/3c5Fh). Sunday, January 19, 2014, Noon to 2:00 P. M.
The woodlands and ponds of this little known area will be explored during an approximately two mile hike. Once heavily farmed, the Acme Pond area has developed into a nicely wooded forest over the past 150 years. Sweetgum, white oak and hickory are the dominant trees. The pond is reputed to be the home of large bass and provides a secluded location for many birds as well as frogs and turtles. Meet at the corner of Hylan Blvd, and Holten Avenue.